Why do a lot of people prefer using contact lenses? The answer is really simple. It’s a lot more convenient and they have most of the correcting powers that normal eyeglasses have. With contact lenses you can have a very active lifestyle, something that you will have to worry about if you’re using eyeglasses. It’s really hard to play basketball with your eyeglasses on right? Nowadays, as you have noticed, most of existing eye care brands manufacture contact lenses because of its popularity. Contact lenses are not only used to correct vision, it can also be used for aesthetic purposes. Contact lenses come in many different designs and colors. You’ll be pleased to know that there are colored contacts available on the market such as green or blue contact lenses. Just in case you didn’t know, there are even white contact lenses that you can use in a Halloween party. Soft contact lenses – These are usually made up of a plastic type with 80% water. These contact lenses are commonly used because they’re very comfortable to wear. They are exceptionally soft which is the reason that are very comfortable. There are two types of soft contacts, the disposable contact lenses and extended contact lenses. As the name suggests, disposable contact lenses can be thrown away after you’ve used it for a certain period of time, while the extended ones can be worn overnight. 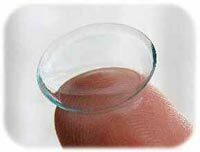 Hard Contact lenses – These contact lenses are usually made of silicone polymers that facilitate the flow of oxygen in the eyes. The good thing about these contact lenses is that they’re durable and they don’t tend to dry your eyes out as the soft contact lenses usually do. The reason? It’s because hard contact lenses allow more oxygen to reach the eyes. One of the drawbacks however is that it’s kind of hard to put in the eyes (and remove too). The best thing you can do if you’re unsure on what contacts you should wear is to ask for your optometrist’s recommendation. Check your directory and look for optical clinics near your place and give them a visit!